master the location of reflex points in the hands and feet, and techniques and procedures to effectively palpate these reflexes on yourself and others. acquire a knowledge of all the physiological systems of the body, and the role Reflexology plays in maintaining optimum functioning of these systems. examine homeostatic imbalances that can occur in the human body and create Reflexology sessions to address those conditions. uncover your strongest appeal as a reflexologist and develop successful, ethical marketing strategies to create a unique, viable healthcare business for yourself. be able to explain the theories and benefits of Reflexology. 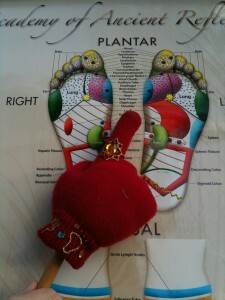 create and operate a professional Reflexology clinic, utilizing medical documentation charts designed for reflexologists. develop and implement community outreach events offering Reflexology. work alongside Academy graduates to educate the community on Reflexology as a way to honor World Reflexology Week. prepare a research case study for national and international publication. recognize the zones of the feet, hands and body. study anatomy, physiology and structural pathology of the feet and hands. within the legal scope of your practice, learn simple therapeutic communication and coaching skills that deliver clear evidence that you hear and support your client’s experience. comprehend the adjunct theories of hydrotherapy, aromatherapy, color and music, and their application to Reflexology. Through skilled touch and loving respect, graduates of the Therapeutic Hand & Foot Reflexology Professional Certification help individuals confront the most challenging aspects of their lives. These skilled practitioners have learned to appreciate the difficulties inherent in charting a path of recovery through the maze of conflicting information and personal beliefs that get in the way of living a healthy and happy life.